Do you have experience working with Jeb Commerce? Do they deserve to be on the top of the Best Web Design Companies list? What do you think of Jeb Commerce? Leave a comment below. 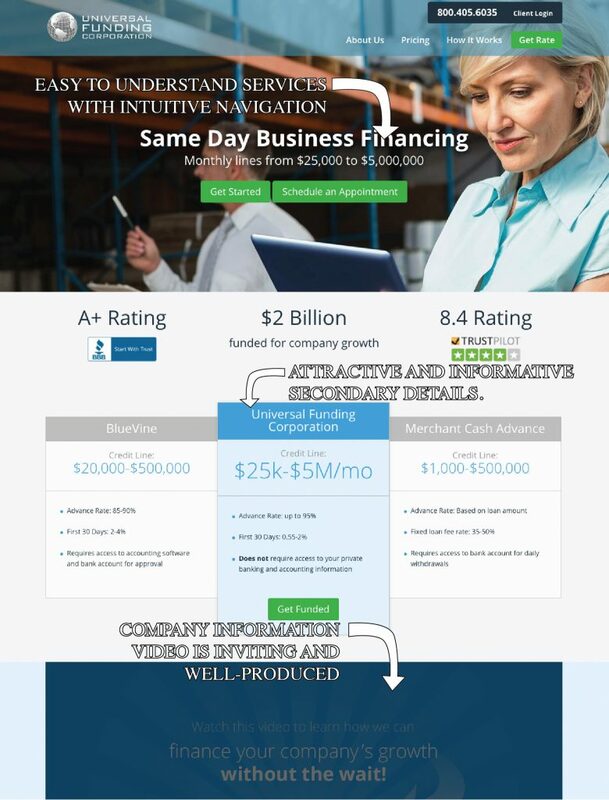 Universal Funding is an online business and personal financing firm who called upon Jeb Commerce to optimize their conversion rate and revamp the UI/UX to be more user-friendly and attractive. The goal was to increase volume of sales while designing a website that aesthetically aligns with their image and company personality. Jeb Commerce succeeded in their task. Universal Funding’s website experience is much improved from their previous iteration. Their services are clearly highlighted and make it easy for the user to access information and navigate the deeper inner workings of the website. As the redesign was focused on conversion rate, there are several pop-ins that muddle the experience a bit, but probably do well to get people to click where UF wants people to click. Above the fold a straightforward set of buttons make it easy for users to start the process of obtaining or learning about their loan. A simple top menu takes you to all other important areas of the site. At first glance, the website is modern and pleasing to the eye, with no obscene distractions that might detract from valuable user information. Scrolling down reveals more detailed information about the various loans Universal offers, followed by a well-produced informational video and a bit more about the company. It all works pretty well, although the aesthetic clarity falls apart a touch as you reach the bottom of the front page. 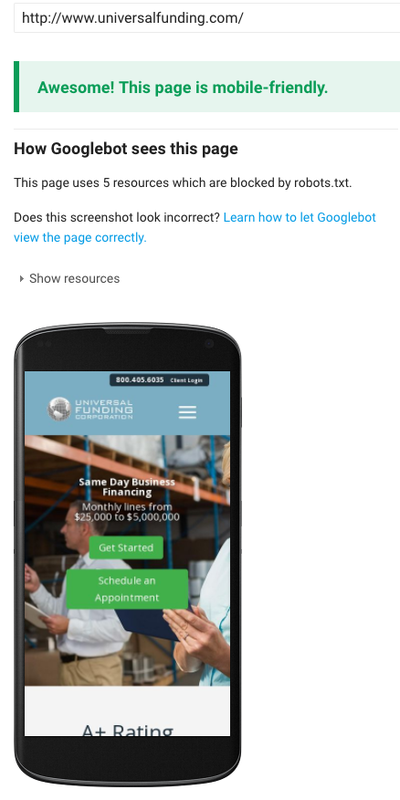 The mobile friendly test graded out high for Jeb Commerce’s effort. We found using the mobile interface to be intuitive, tidy, and helpful in guiding users through their services. While it isn’t quite as easy to set up an account as with using a web browser, that’s to be expected with this kind of outfit. The mobile site does well as a handy compliment to the real meat of the experience when switching over to a computer. Jeb Commerce certainly achieved what they set out with Universal Funding’s website refresh. From the client: “lead volume is increasing, cost per lead is decreasing, and we are closely monitoring lead quality.” It seems their efforts not only succeeded in aesthetic and UX/UI capacities, but in real-world testing as well. Only a few nagging design issues and a less-than-desirable speed test hold this back from being an A+.